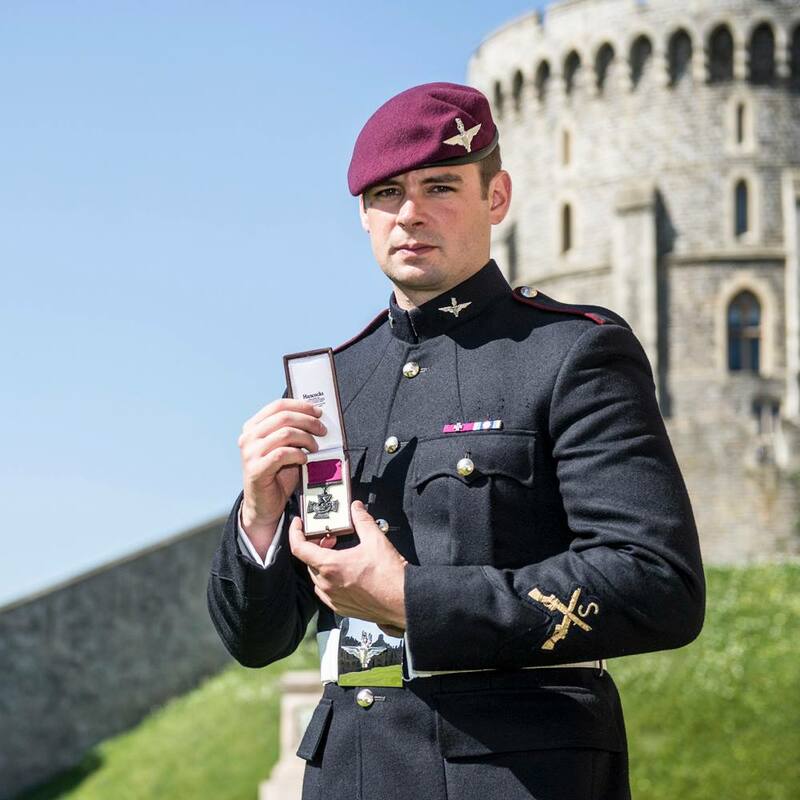 Her Majesty The Queen has presented the Victoria Cross, Britain’s highest order of gallantry, to Lance Corporal Joshua Leakey of the 1st Battalion the Parachute Regiment for heroic action in Helmand Province, Afghanistan. Only three Victoria Crosses have been awarded for the Afghan campaign and Lance Corporal Joshua Leakey, 27, from Hampshire, is the only living recipient, the others having been awarded posthumously. Lance Corporal Leakey was the first of today’s recipients to receive his award from Her Majesty in the Waterloo Chamber. Music throughout the service was provided by the Countess of Wessex’s String Orchestra from the Corps of Army Music. The young soldier from Hampshire was accompanied at the investiture at Windsor Castle by his family. Between May and December 2013, Lance Corporal Leakey was deployed in Afghanistan as a member of a Task Force conducting risky daylight operations to disrupt insurgent safe-havens and protect the main operating base in Helmand province. During what should have been a routine patrol on the 22nd August 2013 with joint UK/US forces, he single-handedly turned the tide of a vicious Taliban insurgent attack and prevented considerable loss of life by taking the initiative and repeatedly running through heavy fire to man machine guns. After dismounting from their Chinook helicopters, the force had come under accurate machine gun and rocket propelled grenades’ fire resulting in the Command Group being pinned down on the exposed forward slope of a hill. The team attempted to extract from the killing zone for an hour, their efforts resulting in their officer, a US Marine Corps Captain, being shot and wounded, and their communications being put out of action. Lance Corporal Leakey, positioned on the lee of the hill, realised the seriousness of the situation and with complete disregard for his own safety, dashed across a large area of barren hillside which was now being raked with machine gun fire. As he crested the hill, the full severity of the situation became apparent: approximately twenty enemy had surrounded two friendly machine gun teams and a mortar section rendering their critical fire support ineffective. Undeterred by the very clear and present danger, Lance Corporal Leakey moved down the forward slope of the hill, and gave first aid to the wounded officer. Despite being the most junior commander in the area, Lance Corporal Leakey took control of the situation and initiated the casualty evacuation. Realising that the initiative was still in the hands of the enemy, he set off back up the hill, still under enemy fire, to get one of the suppressed machine guns into action. On reaching it, and with rounds impacting on the frame of the gun itself, he moved it to another position and began engaging the enemy. This courageous action spurred those around him back into the fight; nonetheless, the weight of enemy fire continued. For the third time and with full knowledge of the extant dangers, Lance Corporal Leakey exposed himself to enemy fire once more. Weighed down by over 60 lbs of equipment, he ran to the bottom of the hill, picked up the second machine gun and climbed back up the hill again: a round trip of more than 200 metres on steep terrain. Drawing the majority of the enemy fire, with rounds splashing around him, Lance Corporal Leakey overcame his fatigue to re-site the gun and return fire. This proved to be the turning point. Inspired by Lance Corporal Leakey’s actions, and with a heavy weight of fire now at their disposal, the force began to fight back with renewed ferocity. Having regained the initiative, Lance Corporal Leakey handed over the machine gun and led the extraction of the wounded officer to a point from which he could be safely evacuated. During the assault 11 insurgents were killed and 4 wounded, but the weight of enemy fire had effectively pinned down the command team. Displaying gritty leadership well above that expected of his rank, Lance Corporal Leakey’s actions single-handedly regained the initiative and prevented considerable loss of life, allowing a wounded US Marine officer to be evacuated. For this act of valour, Lance Corporal Leakey is highly deserving of significant national recognition.